Being inspired by Meridian's personal mod to streamline manufacturing of Annihilator Armor, I decided this concept was something I couldn't live without. Designed for convenience, this mod allows alternate manufacturing recipes of all armors that require a lower armor type in one of its ingredients. All new projects are marked with an asterisk "*" and use raw parts like personal & power armor parts, damaged grav units, synth muscle mesh, etc. 99J7.a Automated merge with Python script identified a few discrepancies that are addressed in this update. Assault Bike needed more money and Car Parts. 99J7: Magical Girl (Fairy) now also needs 2 yellow gems. 99J6: Updated end armor recipes: Harbinger, Annihilator, Jugulator, and Testudo. Increases in time costs for Tac Vest and Tac Armors have cascade effects through multiple armors. 99J5: Tweaks to recipes with Sectoweed. Updated: Saviour, Biosuit, Pestulator, Fairy. 99J4: Updated some of the armor names to comply with Dioxine's new schema. No recipes added or changed. 99J3: Just a note to confirm that the mod still works with 99J3. No changes were needed. 99J2: Just a note to confirm that the mod still works with 99J2. No changes were needed. 99J1 Updated armors to include Glamour requirements for Saviour, Fairy, and Ghost. Updated Moloch & Berserker for new requirements. Updated time cost on Assault Bike, and also fixed time and cost for Smokey 2. 99J1.1 Really fixed Smokey 2 this time, I hope. Edit: May 7, 2018 99J.1 Slight tweaks to Assault Armor. Edit Mar 22, 2018 99i2a.1 Update for new release of 99i2a version from Dioxine. Testudo armor added, and slight recipe changes for Moloch and Plate Armor. Working with BBallin's python script identified multiple discrepancies that had crept into the recipes. Mesh-Refractor, Superhero, Loader, Sorceress, Furiousa, Bio, Pestulator, Doom 2, Shadow, and Assault Bike. Edit Dec 27, 2017: Updated to 99i1. Added Furiousa and Assault Bike. Bugfix: Adjusted recipes for Brute and Annihilator to require 9 Synthmuscle Mesh. Edit Nov 26, 2017: Bugfix released at 99h2.1 A number of items did not have produced items spelled out. Edit Nov 6, 2017: Updated to 99h2. Added Fairy and Jugulator. Updated list order to match Dioxine's. 4 armors updated. Edit: Changes in 99G required updating the mod from sectoid corpses to academy corpses. What counts as "raw parts"? Kustom Power Armor is buyable - so is that a raw part? Or does it use power armor parts? Or unplugged power armor? For drugs, does it just use the drugs directly? Or does it use medical supplies and crack? Or does it use chemicals, and assume that you'll make your own drugs? For armors based on the tactical vest, is the tactical vest itself a raw part? Or does it use armor parts, and assume you'll build the tactical vest? Could we have more information on how it actually works? No, Tac Vests, Buyable Armors, etc, are not used in these recipes, only their components are. The goal is to make it easier to assemble the end product from a pile of simple resources and not have to deal with intermediary steps. Yes, some of these simple resources are manufacturable (Combat Drugs, Rare Earth Elements, etc. ), but I don't base the recipes on these processes, only the "battle field drops." Some armor lines build on each other. (Tac Vest> Tac Armor> Heavy Suit> Defender> Guardian, etc.). There could be many recipes for Defender based on the different configurations of subordinate armors. I have chosen to keep it simple by using the basic ingredients. For those with existing armors that need upgrades, I recommend Dioxine's traditional recipe. The times for these late stage armors is compounded from earlier versions, so it may be faster to buy earlier components from the black market, but it won't be cheaper (not figuring runt costs). I envision these streamlined recipes most useful in late game expansions of the fighting forces, and the need for new high end armor. I'd be interested to hear from anyone who uses this mod, when they use it and if they find it useful or not. Idea is great, maintenance is a PITA. If there would be interest, I can make these duplicates automatically via user option, or new armor flag or something of the kind. Yup. If you can code it, go for it. I agree maintenance as new armors are added or Dioxine tweaks their recipes will be a pain. I can't code it, but I can do yaml, so I did what I could. As a player, I think it's a great idea. It's pretty obvious why. As a modder, I also think it's a great idea. It removes another limitation. Seems good so far in my use. Thou i would prefer if the revenat and brute armor used the much more common/buyable/producible chemicals and crack then combat drugs. Particularly in light that drugs are a consumable and it is conceivable to either disrupt production or field use in large batch cases. Changes in 99G required updating the mod from sectoid corpses to academy corpses. New zip in first post. Really nice, I agree that armor manufacturing is a tad annoying and could use the laser/gauss weapons models (disassembly and assembly). 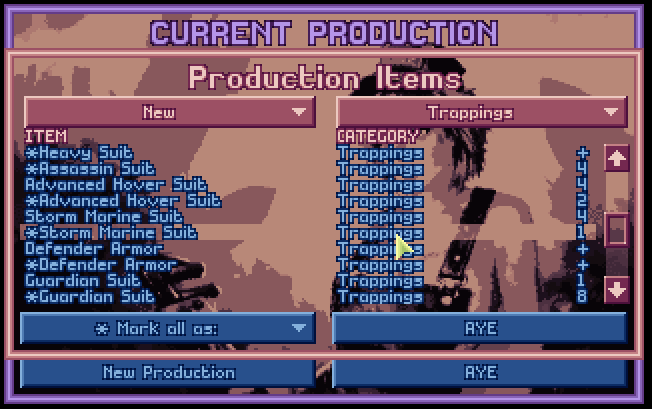 Damn it, just got used to my calculator to pinpoint how much resources I've to pile up to build high-end techs. arbee81 pointed out Batcostume was missing and provided a new recipe for that. He also pointed out that I a bug for guardian armor (still requiring a Defender Armor). Fixed. Oh, my god! Illegal tab! Call Megapol! And, the Need for STR_SECTOID_CORPSE in armors is out of date. Thanks for the catch, Zharkov! I've updated the .zip in the OP.